Everything you love about iPad — the beautiful screen, fast and fluid performance, FaceTime and iSight cameras, thousands of amazing apps, 10-hour battery life* — is everything you’ll love about iPad mini, too. And you can hold it in one hand. For us stylish girls, we know that geek can be chic because along with wardrobe, girls need their tech fix too. This gadget is so cool. Who wouldn’t want to own the new iPad Mini? Disclaimer: I received no compensation for this publication. My opinions are my own and may differ from those of your own. Hot Beauty Health is not responsible for sponsor prize shipment. I’m starting college in Jan. so this would be perfect for classes! Why do I want to win it? Because it’s soooo cute! And, ahem, it would also be seriously awesome to work with. Because my HP touchpad is junk! I pad mini would become my travel connection with the world. because i have never tried any apple product except ipod! I’d love a mini to stay connected on the go. I would love to have the ipod mini to use in my car and when I am walking with the itunes app for sirius/xm. As well I have a special needs child that this device would be much easier to travel with us. This is just the right device and size for me to take to work and doctor’s appointments. I would love to have an ipad mini because I have been wanting any kind of pad or tablet because of all the apps you can use specifially one for grocery shopping and couponing to save money. I don’t have an ipad and this would be wonderful! Because I don’t have any Apple products. Because I am a tech geek and can’t wait to try it out! I would love an ipad b/c I’m starting school in January, am my laptop just crashed. All I can say is, I’ve always wanted one. I have wanted an ipad since they came out and now that the mini is here…. 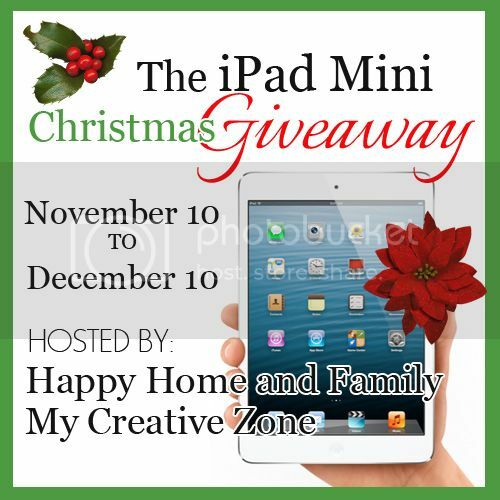 I want the mini iPad so I can give it to my wife and get my iPad back. I want to win the ipad mini because I would love to have something that’s portable and compact to bring to school with me, as well as for traveling! My itouch was stolen when someone robbed my apartment as I was moving out. They also took all the money from my wallet. 🙁 I’d love to have an ipod again to help me when I work out… Eye of the Tiger blasting away = great workout song! I would love an iPad mini for my daughter. I want to win something new for hubby to play with. I would like to win this because it would be a great gift that I could give to my sister. She has taken care of me for a very long time and because I don’t have a job I am unable to buy one for her on my own. What a superb price! this is such a nice opportunity. Hello from Amsterdam by the way! A XMAS gift for me! No real reason, I just would love to have one. my bf is tablet-less… he would love this! It would be a Christmas gift for my niece. My Husband is getting ready to Deploy over to the middle east, and this would be a great way to communicate ! I want the iPad Mini to stay connected while I am on the go. I don’t have an iPad.